Last evening a good friend sent me a link to a Zenit article written by Father Tom Rosica, C.S.B., and entitled: "The Ignatian Qualities of the Petrine Ministry of Pope Francis." My friend included an accompanying quip: "Just saw this freaky article on FB. Read the last paragraph." Francis breaks Catholic traditions whenever he wants? 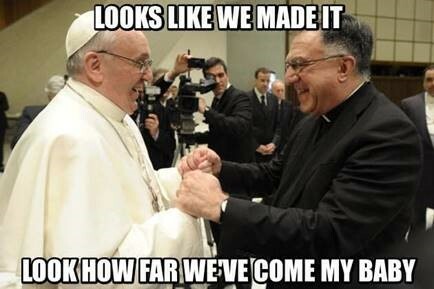 Jump sharks much, Father Tom? Nothing particularly surprising here, of course, coming from Father Tom. What happened this morning, on the other hand, is where it really gets fun. When I went to comment on this eminently "freaky" article, well, what do you suppose I discovered? That's right, the God of Surprises had struck again! Most of the good stuff in the offending paragraph of the article in question had mysteriously disappeared. Pope Francis has brought to the Petrine office a Jesuit intellectualism. By choosing the name Francis, he is also affirming the power of humility and simplicity. Pope Francis, the Argentine Jesuit, is not simply attesting to the complementarity of the Ignatian and Franciscan paths. He is pointing each day to how the mind and heart meet in the love of God and the love of neighbor. And most of all, he reminds us each day how much we need Jesus, and also how much we need one another along the journey. What happened to Father Tom's point about Francis the Tradition Breaker? Little wonder someone demanded an emergency edit. This is an astonishing admission on Father Tom's part. I guess these guys are getting so giddy over Francis that they can't necessarily be trusted not to get all carried away and start letting cats out of bags all over the place. Nevertheless, the insufferable Father Rosica is quite right: "Pope Francis breaks Catholic traditions whenever he wants..." Indeed. Spot on, Father Tom! That cat's not only out of the bag but it's stuffed and hanging up on the mantle. These men are not very slick. In fact, they're so transparent now that it really must be said of those still defending Pope Francis as a 'humble" man of the people: they're willfully deceiving themselves, apparently incapable of handling the truth, which is that this is a coup d'église of the first water. This is revolution, pure and simple. Thanks for being candid, Father Tom! And let's hope those over-zealous Zenit editors will stop messing with your stuff.